When sick with the flu or the common cold, your focus is on recovering and getting back to work or school. But not forgetting about your hygiene will keep your teeth healthy and in good shape. 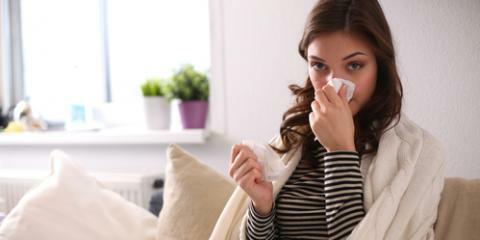 There are a few things you can do to maintain a good home care regimen as you fight the cold and other common winter ailments. It can be hard to muster the energy to continue to brush and floss properly when you are sick, but doing so will keep your teeth healthy. It is important to remember to not share your brush with anyone, whether sick or not, as doing so allows the spread of bacteria from one person to the next. Also it doesn’t hurt to swap out your brush for a new one after you have recovered since toothbrushes can harbor bacteria. If you experience vomiting while sick, try not to brush right after the incident, as this can distribute the acid around the mouth. It is better to rinse initially either with water or a mouth rinse and then brush a short time later. Many cough medicines and cough drops contain large amounts of sugar and other sweeteners. Sucking on cough drops allows the sugars to coat the teeth for extended periods of time and increase the potential for tooth decay. This is even worse, it you fall asleep with them in your mouth. If possible, try to choose medicines that are sugar free. And brush your teeth or rinse after using these products. Do the same if you consume homemade remedies that involve mixing hot water or tea with lemon and honey. Staying hydrated with fluids will help you fight a cold, but will also keep your oral cavity moist and less prone to decay. Dry mouth can cause decay, due to the fact that you have less saliva to buffer your mouth from the bacteria that are ever present. And the medications that you take for the cold, may cause dry mouth. So remember to try to drink lots of fluids and water while sick with the cold or flu.